How can a dog be utilized successfully to benefit patients in a dental practice? It takes extensive planning, preparation and the right type of dog that has the right type of certification and training. I am a Dental Hygienist at Smile Cabarrus in Harrisburg, NC and ATKINS, a Rehabilitative Facility Dog, raised and trained by the paws4people® foundation, comes to work with me each day and is a strategic and successful member of our dental team. She assists with our adult and pediatric dental hygiene and restorative patients, mitigating their symptoms of dental anxiety by using deep pressure therapy. Dental phobia is an intense fear that causes individuals to avoid the dentist. Several adult patients that would be classified as having “dental phobia” now come to our office because of ATKINS and the animal-assisted intervention she provides. The quality of life of these patients has improved because they have received much needed dental care. 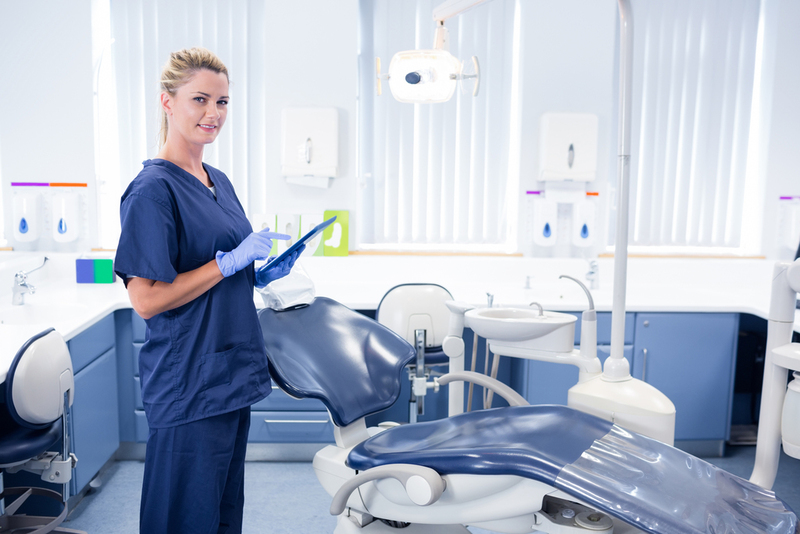 It is common knowledge that the majority of our patients would rather be anywhere else than in the dental chair. 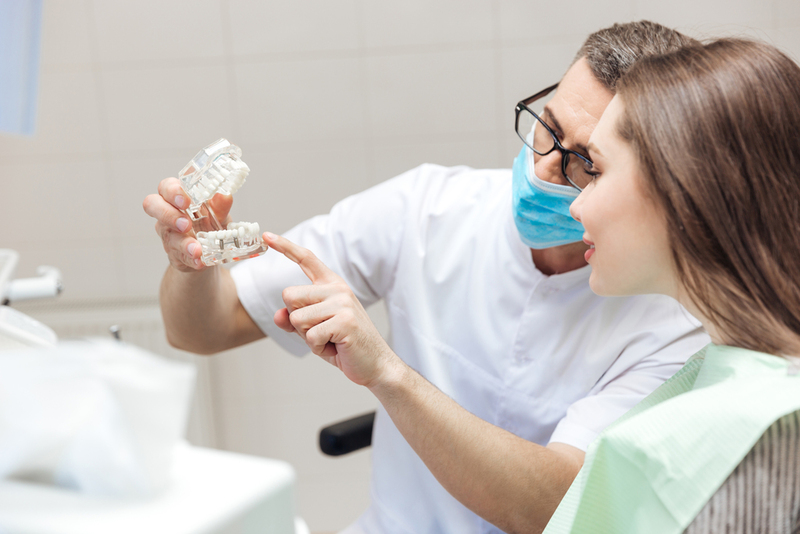 It is estimated that 80% of dental patients have some degree of anxiety. ATKINS creates a fun, relaxing dental experience that benefits a wide range of patients, from those who just love dogs to those who have dental phobia. ATKINS began her training at paws4people® at a few weeks old and continued her training, non -stop, for over two years. She was trained specifically to be utilized in a dental office. Her extensive training enables her to be quiet and controlled during the entire workday. She is a Service Dog and when she is in her vest she is all business. She is not a Therapy Dog. There is a big difference in the training of Therapy Dogs and Service Dogs. Certified Therapy Dogs can be pets with obedience training. Training is not required of their handlers. In order to be a certified paws4people® Facility Dog Handler, I was required to complete 50 hours of individual training, attend a two-day seminar, complete several on-site observation sessions, and a final observation test. I believe that the success of ATKINS in our office not only has to do with her extensive training but my training as well. There are many other factors to consider before bringing a Service Facility Dog into your practice: a solid workplace plan that includes “dog free” zones for allergy/fear prevention, staff training, a page dedicated to your dog on your website with FAQ, liability insurance and a strategy to overcome objections from staff/patients. My long-term goal is to help incorporate the utilization of Service Facility Dogs in dental offices nationwide. In order for this goal to become a reality, it is vital that as dental professionals we become educated on how to ensure the success of Service Facility Dogs in a dental office. I have developed a CE Course, “Best Practices for Utilizing a Service Facility Dog in a Dental Practice. If you would like information about this course please feel free to contact me at BKuceraRDH@gmail.com, and feel free to follow our journey on our Facebook page!